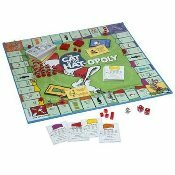 This Cat in the Hat-opoly board game is a great game whether it's rainy or sunny! This fun and funny game merges the Universal Studios movie with a classic American board game. Players get to choose from six pewter tokens: The Cat in the Hat, Thing 1 & 2, Sally, Conrad, Nevins, or The Fish, and advance to "All the Fun You Want!" They can buy property, collect Fun-in-a-box, and trade them in for a Cat's Hat. Challenges like getting fishnapped, developing bad cat-itude, and having trouble getting your swerve on make things a little more difficult and a lot more fun! Ages 8 and up.